OFFPRICE exhibitors sell clothing, accessories, footwear, jewelry and more at a significant discount. Both major labels and non-branded goods are sold by OFFPRICE exhibitors for the lowest prices on the market! When you have a growing business, the search for new products at low price points can be difficult. 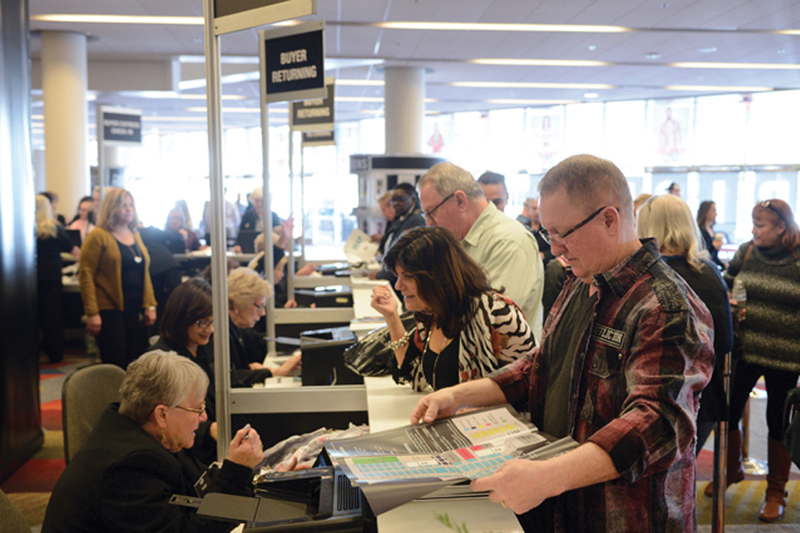 This hunt has led many companies all over the globe to source at the OFFPRICE Show – an order-writing tradeshow held during Fashion Week in Las Vegas. With over 500 vendors and more than 1,300 booths, OFFPRICE is the largest tradeshow of its kind in the country. Add excitement to your stores and increase your profits by sourcing at OFFPRICE! Whether you're looking for apparel, footwear, accessories, or jewelry, you'll find it at our show for 20%-70% below wholesale. Come see for yourself why the OFFPRICE Show is the must-see for smart buyers! Our dynamic, order-writing trade shows connect retail apparel buyers of all sizes to the leading off-price specialists who sell accessories, footwear and more at 20%-70% below wholesale. Our exhibitors sell clothing and accessories at a significant discount. They are able to sell these major labels and non-branded goods at such low prices by capitalizing on the forecasting mistakes and canceled orders made by full-price retailers. When manufacturers have more product than they can move, or a store can't sell out of a specific style, they'll sell the inventory to our exhibitors at a significant price cut. Our exhibitors then buy high volumes of the product and move it quickly, enabling them to sell to our buyers at rock-bottom prices. The OFFPRICE Show is a professional trade event. It is produced for the fashion industry and is NOT OPEN TO THE PUBLIC. Admission to the OFFPRICE Show is FREE to members of the retail industry. Otherwise, the cost is $125 per person for suppliers (including factors, shipping & logistics providers, manufacturers and other providers looking to network with our exhibitors). DIRECT SOLICITATION OF OUR EXHIBITORS IS STRICTLY PROHIBITED BY SHOW MANAGEMENT. Check your bag free of charge with your OFFPRICE Show badge in meeting room 101. Utilize the Business Center for photo copying, printing, faxing, and shipping. Located on the lower level of the Sands Expo. If you would like to be an OFFPRICE Show partner for the August 2019 show, please contact Melissa Miller, Marketing Manager. Looking for an OFFPRICE Show staff member or have any questions about the OFFPRICE Show? Stop by the Show Office, which is located next to Cafe 3537 in booth 3137. Shuttle buses are free for OFFPRICE Show attendees. Shuttles pick up and drop off at the Venetian Shuttle & Transportation Area (located across from Cash & Carry on the lower level). Show your OFFPRICE credentials to ride for free. Shuttles will run 8:00 a.m. - 6:30 p.m. with the last pick up being 6:00 p.m. Available at the Taxi Lane outside the main entrance of the Sands Expo. Get a competitive edge at the OFFPRICE Show by reserving an appointment with an OFFPRICE staff member to get insider tips! You'll learn the ins and outs of the show, how to source the best deals, and which exhibitors carry the products you seek. During this tour you will have the opportunity to network with other buyers and ask any preshow questions. Schedule a tour by contacting Mikaela Kornowski, Buyer Relations Manager, at 262-754-6910. I’ve been looking for a one-stop-shop for women’s apparel and accessories. At the OFFPRICE Show, I found three vendors that interest me greatly. I plan on visiting their showrooms as soon as I can! It took me over two years to find this treasure! The OFFPRICE Show was amazing! So much to choose from, and the vendors and staff were extremely helpful. Worth the trip no matter who your target customer is - outstanding prices and quality merchandise. We will be back every time!! Kathy Haynicz, Jersey Guys Menswear, Williamstown, N.J. I came to the OFFPRICE Show for the first time, looking to expand into more fashionable apparel. I found a variety of goods which was very helpful. The show was excellent and the layout was great. I look forward to the February show.